The large solar storm that hit the Earth yesterday was expected to interfere with cell phone calls and GPS transmissions. 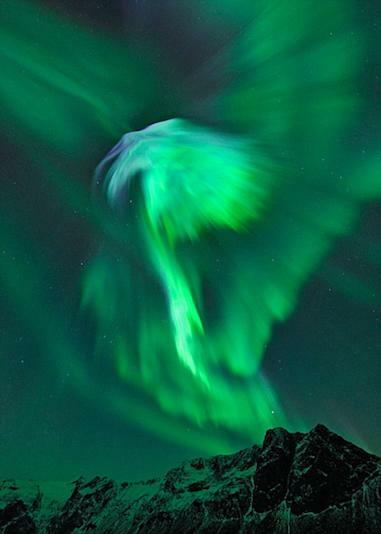 But the storm was also a boon for photographers--who captured the Northern Lights in full effect. The Northern Lights are formed when particles from the sun collide with atoms above the Earth's atmosphere. The particles are propelled toward earth at speeds of around 1 million mph by "coronal mass ejections" from the sun's surface. The particles are then drawn to the magnetic field of Earth's northern and southern poles. They appear as a blue, green, purple or red haze in the sky depending on whether they combine with oxygen or nitrogen atoms, and at which altitude these collisions occur. The Northern Lights were given their name by Pierre Gassendi in 1621, combining the name of the Roman goddess Aurora and the Greek word for the north wind, Boreas. You can view more pictures from yesterday's storms here.